Three clicks and about 3 minutes is all it takes--to let your members of Congress know you support bicycling and walking. Eleven Missourians are visiting Washington, DC, the week of March 7-11 as part of the National Bike Summit. 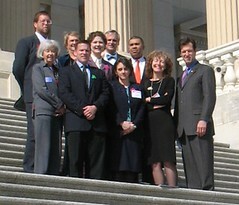 Members of the delegation will be visiting every Missouri congressional office on Thursday, March 10th, 2011, making the case for better, safer bicycling and walking in Missouri. You can help--your message message of support to your own members of Congress really multiplies the impact of the delegation's visit. It only takes about three minutes. A short call is very easy and very effective. Sending an online message is effective as well. Find your members of Congress, their office phone numbers, and online contact info. The National Bike Summit is taking place today in Washington and a delegation from Missouri will be visiting your office. 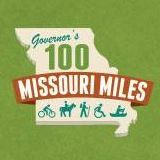 I hope you'll take the time to meet with them, because bicycling and walking is very important to Missouri and to me. - Federally funded roads and highways cut right through every city and town in Missouri, and when they are not built to allow people to bicycle or walk along or across them, the result is that entire neighborhoods become unwalkable and unbicycleable. THANK YOU! When you contact your elected representatives, it really does make a difference!